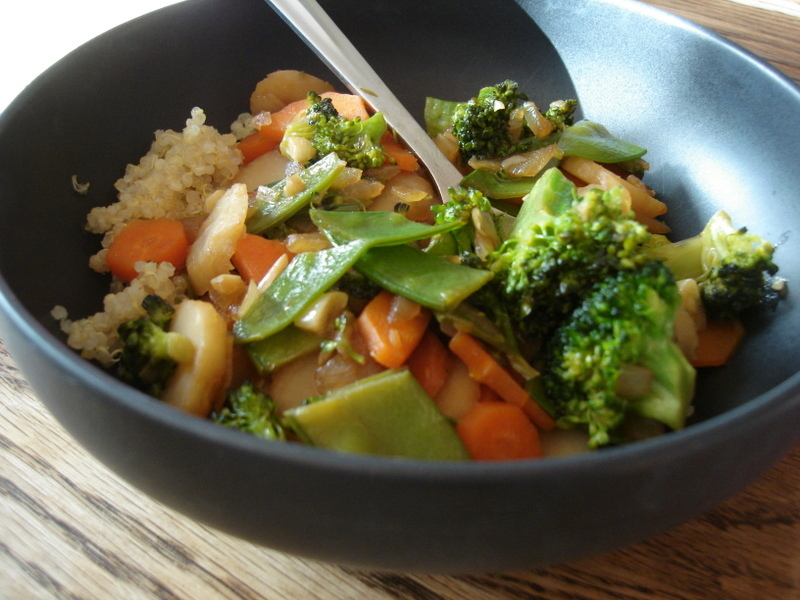 We just LOVE stir fry around this house! The kids eat it up like it’s going out of style. Also since dear hubby is Asian he has a true love affair with WHITE rice. The kids definitely take after him in that! I think they have his Asian blood! I too have been bitten by the bug and would definitely prefer white rice over pasta or other carbs, but in our current lives we’ve cut it out almost entirely. Occasionally we will have fried rice and for that there is no substitute! I just go with it, have the white rice and treat it like dessert! SO yummy… but that is a post for another day… although maybe it won’t be a post at all. I do most of the cooking around here, but hubby is definitely the pro at fried rice. I’ve attempted a few times, but my kids well tell me, “It isn’t as good as Papa’s!” So it probably isn’t worth posting one of my recipes! Maybe we will have a guest post and dear hubby can share! Don’t hold your breath! 😉 Not sure that will ever happen! So.. on to our stir fry. I often just take a gander at what is in the fridge and just throw it all together. It’s a great way to use what veggies are left over and hide some not so favorites! We have also started serving it over [amazon_link id=”B0036FB6FY” target=”_blank” container=”” container_class=”” ]quinoa[/amazon_link] instead of rice. Not quite as good, but a great substitute. The kids love it and Brian is ok with it. I also like stir fry because it is a cheap and easy way to feed lots of people. Also, by using the [amazon_link id=”B0036FB6FY” target=”_blank” container=”” container_class=”” ]quinoa[/amazon_link] which is high in protein it helps to fill you up without having to add meat! I often don’t add meat to it, especially if I’m making it for lunch. Here are the most common ingredients that I use, but it can be changed in 1001 different ways. I’ll have a few variations at the bottom! 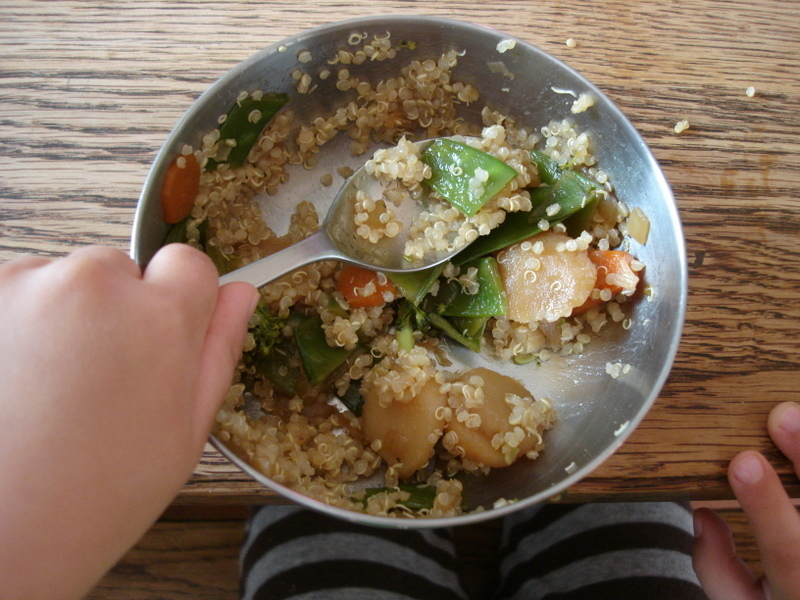 Cook [amazon_link id=”B0036FB6FY” target=”_blank” container=”” container_class=”” ]quinoa[/amazon_link]. Usually takes 2 cups of water per cup of quinoa. I often cook mine in the [amazon_link id=”B002CVTT52″ target=”_blank” container=”” container_class=”” ]rice cooker[/amazon_link]. Then it’s quick and hands off! Add oil of choice to wok (I usually use [amazon_link id=”B003QDRJXY” target=”_blank” container=”” container_class=”” ]coconut oil[/amazon_link], occasionally bacon grease) and cook onions until transparent and garlic soft. Add broccoli, carrots, [amazon_link id=”B0043RKUP6″ target=”_blank” container=”” container_class=”” ]tamari[/amazon_link], water and [amazon_link id=”B0001DMTJG” target=”_blank” container=”” container_class=”” ]oyster sauce[/amazon_link]. Cook for about 5 minutes with lid on to cover and steam. At end add water chestnuts and sweet peas. Cook until water chestnuts are warm and sweet peas are blanched. Serve over [amazon_link id=”B0036FB6FY” target=”_blank” container=”” container_class=”” ]quinoa[/amazon_link]! [amazon_link id=”B0001DMTJG” target=”_blank” container=”” container_class=”” ]Oyster sauce[/amazon_link] often has a lot of sugar in it. If you have a good fermented version please share! In place of [amazon_link id=”B0001DMTJG” target=”_blank” container=”” container_class=”” ]oyster sauce[/amazon_link] can use fish sauce and a bit more water and a bit of [amazon_link id=”B000EDM6KU” target=”_blank” container=”” container_class=”” ]arrowroot[/amazon_link] to help thicken it. Can add hot peppers or some hot sauce to give it a bit of a kick! And this is what you end up with! No veggies left in the bowl! When we had this last week, my oldest, Tonchi (4), had THREE servings and still wanted more! And then cried when there wasn’t any broccoli in his last serving!